PORTLAND, ME – Avesta Housing, a nonprofit organization headquartered in Portland, Maine, was recently named as one of the 2018 Best Places to Work in Maine. The awards program was created in 2006 and is a project of the Society for Human Resource Management – Maine State Council (MESHRM) and Best Companies Group. Partners endorsing the program include: Mainebiz, the Maine State Chamber of Commerce, the Maine Department of Labor, the Department of Economic and Community Development, and Maine HR Convention. This statewide survey and awards program was designed to identify, recognize and honor the best places of employment in Maine, benefiting the state’s economy, its workforce and businesses. The 2018 Best Places to Work in Maine list is made up of 75 companies in three size categories: small (15-49 U.S. employees), medium (50-249 U.S. employees) and large (250+ U.S. employees). Companies from across the state entered the two-part process to determine the Best Places to Work in Maine. The first part consisted of evaluating each nominated company’s workplace policies, practices, and demographics. The second part consisted of an employee survey to measure the employee experience. The combined scores determined the top companies and the final rankings. Best Companies Group managed the overall registration and survey process in Maine and also analyzed the data and used their expertise to determine the final rankings. Founded in 1972, Avesta Housing is a nonprofit affordable housing provider focusing on advocacy, development, property management, senior/assisted living, and homeownership. The organization is headquartered in Portland, Maine and currently has 87 properties, 2,400 apartments, and two assisted-living facilities in its portfolio. In line with one of Avesta’s Core Values, Humanity: We Care About People, Avesta Housing strives to create strong teams, meaningful career growth, and outstanding work environments. In the past year, Avesta improved an already-robust benefits package. Expansion of benefits included industry-leading paid parental leave and an increase in paid time off for all staff. These benefit improvements and others were made based on the research and recommendations of a staff-led committee. 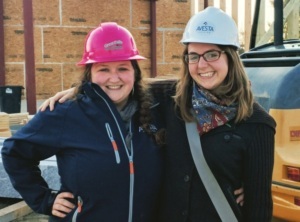 Cutline: Avesta Housing employees Sarah Thurston and Lucy Cayard visit an affordable housing property under construction in Portland, Maine in 2016. Avesta Housing was recently named a 2018 Best Places to Work in Maine.